When Jacey of Damsel in Dior asked me to be part of a style collaboration featuring a pair of colored skinny jeans by Agave Denim, I instantly said yes. I had the opportunity to meet Jacey, Kiara and Kimberly at the LuckyFABB conference this past April and was thrilled to be in such great company with these sweet and talented bloggers (how amazing do they all look?!). Not only are my Agave jeans beyond comfortable, I absolutely love the rich blue color and the zipper detail at the ankles. They have quickly become a weekend staple and I love that I'll be able to wear them year round. I have a similiar pair from Zara....I love them and can't stop wearing them! Cool way to style those fab jeans, Audrey. Once again, you look so beautiful! I love collaborations like this! I love how you combined 2 shades of blue together. Everyone did a great job stylish the blue denim! LOVE the zipper detail on these jeans. brings me back to my "guess jeans" days! =) and that clutch...GORGE! Waoo, just amazing, I like you, you are very pretty and beautifull. How do you do for make so nice pictures? May be if I can do it, I will have a higher blog and folower..
audrey those jeans fit you like a glove but more importantly they look soo comfy and soft!!! you look fabulous! the color is fabulous and the fit is perfect on you! Cute look! I love that top! What a fun collaboration! You all wore the pants so differently. Definitely fun to see. love when jeans have zipper on the side!! I found your blog through this collab with Damsel in Dior, and I have to say, I've already added you to my Google Reader! You always look so fantastic. Love these jeans. i love blue. you look amazing! So cute as always! Love those shoes on you too. The shape of them is really unique!!! yay..that's really great! I love that your skinnies have the zipper detail! and looks amazing with the blousy top!! Love those jean! Thanks for introducing me to the other bloggers! Love how you styled the jeggins! I just discovered your blog and am now following on bloglovin. love those jeans, the zippers totally make them! Love the color of those jeans! You look absolutely fabulous! Lovely style and amazing pants. Love the blue color. You carried it well Audrey....all lovely ladies!! I love collaborations...it's always so much fun to see the different personalities and styles that come out around the same wardrobe piece! Love the way your darker, loose top emphasizes the saturated blue and fun skinny zip ankles of these pants. Fun post! Loving those jeans! The color is great! You look super gorgeous. I'm loving how long your hair is these days. That chanel clutch is do die for. These jeans are amazing, and I love how you styled them! Blue is one of my favorite colors, and I love how you paired them with those chunky heels! Gorg! Love the color and the zipper detail! Everyone looks so stylish and chic! Looks like the LuckyFABB event was a lot of fun! How fabulous to make new friends at an occasion like that and to collaborate later on! Those jeans look fabulous on you my dear. Love the way you styled them - as always! And thanks so much for your lovely comment. I have to tell you that it is a lot of work to look good after 40, though, and that's why I plan to retire as a model... I haven't quite figured out yet how I can possibly make my blog work with other girls, that's why my posts are rather random than regular LOL! I love this outfit! Simple yet chic. 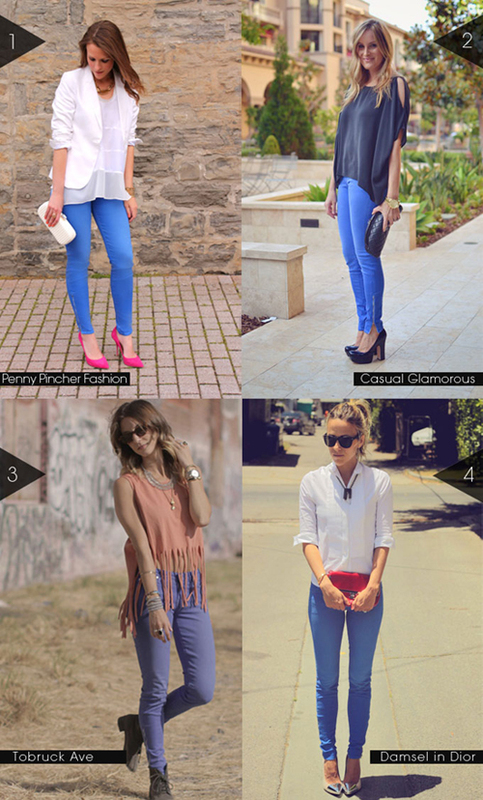 I love how you kept the outfit simple, adding a op of colour with those stunning blue jeans! I've never thought to try blue as a colored jean. I'm going to have to give it a try. A nice safe way to try out the trend!